Have you thought about where your NEWS comes from? It shouldn’t come as a surprise to us that we cannot believe everything we hear. As Aristotle put it, “be a free thinker and don’t accept everything you hear as truth. Be critical and evaluate what you believe in”. If the most influential mind in philosophy and free thinking was already warning us to be careful of fake news around 350 BC, how much more do we need to be aware of what informs us in 2018? A quick google search of “the truth is that…” along with the topic of ‘Donald Trump’ produced a huge range of proposed truths that could not be further apart along a dichotomy of opinion. “The truth is hard, hard to find, hard to know. The truth is more important now than ever.” Writes The New York Times. I promise to try my best and represent the above image in the spirit that Vanessa from Ad fontes media constructed it. 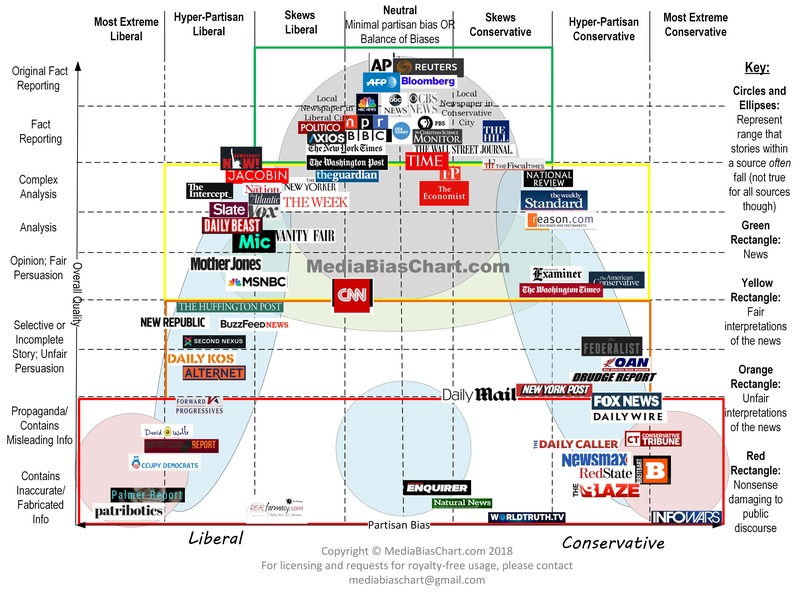 This image has two scales, the overall quality of content reported and the generalized partisan bias of the agency. After taking weighted averages of scores of articles from each news agency, the agencies are charted and form the shape of an upside-down U. Some similarities are shown here to a normal distribution. Interesting observations made by Ad fontes media are: Bloomberg and Reuters are used by RussellStone Group frequently due to their factual reporting; CNN falls on the line of fair/unfair interpretation of news, and Fox News falls within nonsense that is damaging to public discourse. There is no right or wrong place to get your news and information from, except if there is only one place or source that you allow to inform you. As people with access to more information than at any other time in the past, we have the opportunity to inform ourselves very thoroughly. South Africa is Not a Junk Country. What Does Land Expropriation in South Africa Actually Mean? Since SONA, the term land expropriation has been thrown around by the ANC. This is not surprising given that the party is doing all it can to regain mass support.